In the past few days, my Facebook has blown up with posts having to do with Brazil. And, as I’ve begun reading about Brazil, both in what friends post and in other reports across the web, I find myself wondering: What is the answer? A good article from The New York Times on the topic. What it boils down to seems to be this: People in Brazil are fed up with years of inequalities, most recently made worse by the stadium builds going on for their upcoming role as host to the 2014 World Cup and the 2016 Summer Olympics, and so are protesting for a better, less corrupt country that will do more for their people and less for the world stage. Now, I have to be honest, I don’t know enough about Brazilian politics as a whole to comment on their government, either how it is or how it should be. I’ll leave that discussion to people who are from Brazil, or who live there or have been following the issue for longer than the last few days. I won’t do those issues the dishonor of my having an uninformed opinion on them; they deserve better than that. But for me, as an American, another question surfaces, one that I feel compelled to at least consider, even if I don’t have a pert answer for it: How should international sporting competitions be arranged? Because, to an outsider, it would seem that hosting not one, but two massive, worldwide events would be good for Brazil. To an outsider who has, for the past seven years or so, heard nothing but glowing praise for the burgeoning economies of places like Brazil and China, it would seem only natural that they would begin hosting events. To an outsider who has heard, time and again, that people from places like Brazil–indeed, Brazil seems always to be the go-to example of this–often find themselves disappointed by the relative poverty of places like the US compared to their home, it would seem indicative of Brazil moving, justifiably, into the world’s spotlight. But then you look at the details. You watch things like Carla’s video that I linked above, and you realize that having international events costs billions of dollars, and those costs come down on the country’s people, whether they want them to or not. 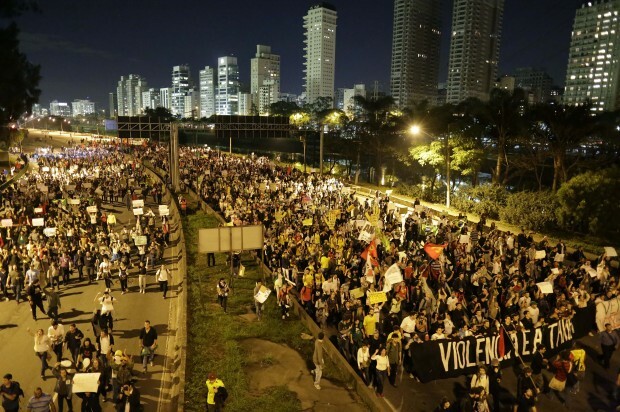 You look at things like the 2008 Beijing Olympics and their controversial eviction of 1.25 million citizens to make way for the games, and you see them coming up again in Brazil. In fact, many have argued that hosting the Olympics is actually not good for the local economy at all. With conditions this rough, it would be easy to make the argument that all major international sporting events, if they continue to exist at all, should be hosted exclusively by countries with a proven track record of financial and social stability; countries that can absorb the shock of a difficult hosting job. Countries like the United States, the United Kingdom, Canada, Australia, Japan, Germany–first world countries. But can you imagine the fallout if the powers that be actually did that? If you put economics to one side, what would be the implications of pushing all the World Cups, all the Olympics, into the countries that are already in the metaphoric 1%, handing yet another wand of power into the hands of the already powerful? There would be outrage. Horror. Cries of institutionalized discrimination against developing countries; charges that growing countries could never fully blossom without the opportunity to compete on their own home turf. Accusations that the Powers that Be were further complicating the preexisting prejudice in favor of the favored few by directing all the world’s interest and money elsewhere in yet another venue. And they might be right. In terms of educational value, having international sports shifting from country to country highlights the diversity of the world; children grow up seeing each unique culture of the host countries exerting influence on their favorite sports, learning about the unifying nature of humanity in friendly competition. And isn’t that the point of international sports, anyway? They show off athletes in the peak of their abilities, certainly, but isn’t it equally important that they show off each country in the peak of their abilities? I don’t have an answer for this any more than I have an answer for the protesters in Brazil. There is clearly a problem, and it becomes more obvious with each new country left scurrying before and after the tornado of the international sporting spotlight touches down on its shores. I feel for the people of Brazil, and I sincerely want the best for them. This entry was posted in America, Controversy, Culture, International, Politics and tagged 1st world, Australia, Beijing, Beijing 2008, Brasil 2014, Brazil, Brazil 2014, Brazil 2016, Brazilian, Canada, China, developed countries, developing countries, FIFA, First world, football, Germany, Japan, Olympics, politics, protest, soccer, sporting, sports, Summer olympics, United Kingdom, United States, World Cup by bekahgraham. Bookmark the permalink.